CHESS for Children Activity Book. Type: BOOKS. Detail: Chevannes, S. Product Code: 9781849942843. 120 pages, softback. A great present for a child aged under 12 who wants to be be better at chess. The book works well as a companion to the earlier book, Chess for Children, but also as a standalone activity book. Packed full of fun games, puzzles and activities so kids can enjoy themselves learning chess. 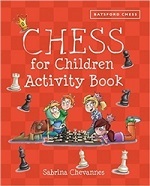 The book includes puzzles and games, some easy variants of chess, and a guess the next move section, along with 'revision' pages to help remind children of the chess basics. All are accompanied by easytoread chess boards and fun illustrations.